Well I didn't have a Red, White & Blue painting for Memorial Day, but did finish this painting this week which I call Blue & White & Blue. If you've been following my blog for awhile, by now you know I LOVE hydrangeas and love to paint them. They are a lot of fun and seem to have their own little personalities with the little petals that stick out in different directions and catch the light. Over the past few years of working on more still life paintings, I've also amassed quite a collection of blue and white ceramic pieces including some Blue Willow (from the famous Blue Willow restaurant in Social Circle GA), other Chinese pieces from various antique shops, garden shops and any/everyplace else I run across them. ( I have got to stop! I mean shop). 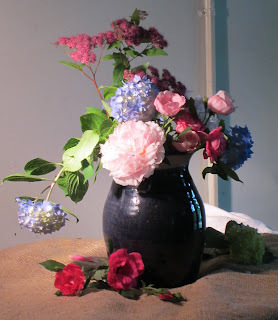 The blue and white goes beautifully with lots of color combinations for flowers- red, yellow, pink and of course blue. Have a happy Memorial Day weekend. Hope it's a great kick off to a fun-filled summer! 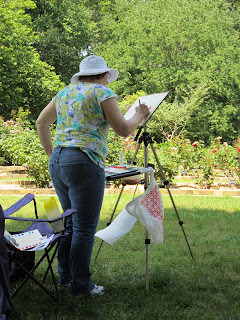 In the last post I shared a plein air painting I did in watercolor last week at Smith Gilbert Gardens in Kennesaw, GA. I was there another day that week and did the same scene in oils, which I promised to share, so here it is. having a little trouble translating form painting to an accurate photo of it, this was the closest I coud get, but still doesn't quite do the real thing justice. The red roses on the trellis are not quite as bright in the real painting as in the photo, so the emphasis in the painting is more on the peach rose bush in front. 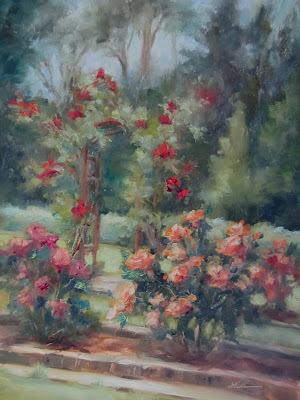 Taught a plein air workshop at the lovely Smith Gilbert Gardens in Kennesaw, GA yesterday. The weather was ideal for painting outdoors- not too hot, not too cold, a nice breeze, sunny. They have a beautiful rose garden with over 100 varieties of roses. This was my demo painting from the morning. Painting all those greens was definitely a challenge. Also wanted the light peach-orange roses in the front to be more of the focal point, so it posed a challenge to have that remain the star and not be overpowered by the trellis with the red roses. Of course I could have eliminated the trellis or changed the colors of the roses to something less prominent, but I wanted to see what it would take to make it work. With gardens you have to simplify, simplify simplify- even more than a traditional landscape scene. I think next time I will simplify even more. Below are some photo's of the rose garden area as well as some of the students painting under the shade of a big old tree looking out to the rose garden area. I'm going back to teach another one day workshop in September, so if you'd like to join us for some fun next time, please contact me at patfiorello@aol.com and I'll email you some additional details. Students of all levels and any mediums welcome. 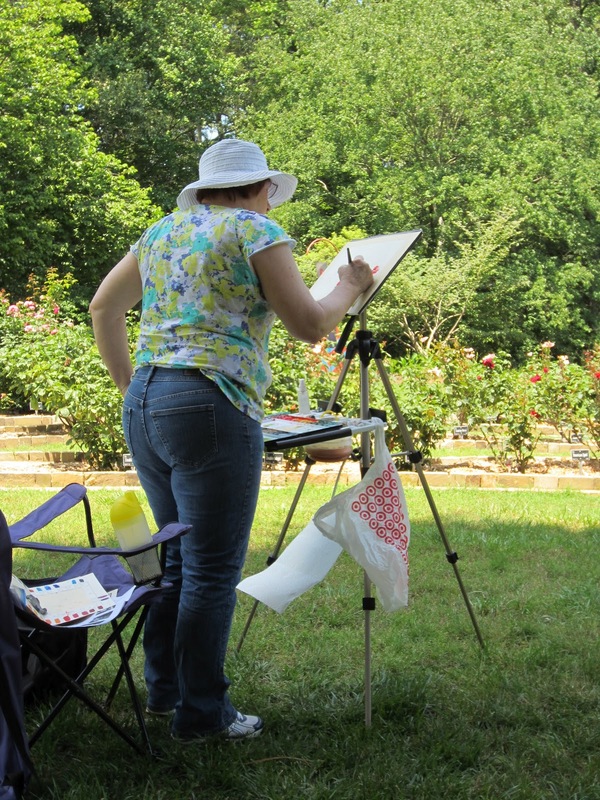 If you've never painted outdoors before and want to give it a try, this is a great location since it is a manageable size and not very crowded, especially during the week yet has lots of interesting subject matter for painting. After a struggle with peonies in a disappointing painting a couple of weeks back I had all but sworn off ever trying to paint another peony. 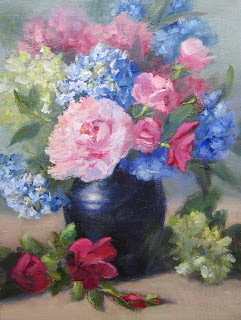 Of course, that week in my oil painting class the instructor had set up- what else- peonies. So I decided to face my fear and give them another try. Below is a photo of the set up. I changed things up a bit to eliminate some of the leaves on the left in favor of repeating the light green hydrangeas and made a few other minor changes. I'm glad I didn't give up on the peonies as I did learn something and don't feel like I have to avoid them in the future. A big lesson learned is to make flowers life size or smaller. The peonies I didn't like were on a larger canvas and lost something in the translation once they were larger than life size( I called them the "Peonies that ate Cincinnati"). Here's another take on the Sunflowers and Irises I posted last week. I had the same flowers and did 2 different demonstrations- one for my morning class and one for the afternoon class. I didn't want to do the exact same painting twice, so altered the composition. This was the first one and the painted I posted on May 9 was the 2nd version. Which do you prefer? What lies between comfort and panic? ( and ignore all those critical little voices in your head). The LEARNING ZONE is where you grow. While the subject matter of flowers is familiar to me, this particular painting was a bit out of my comfort zone. I used stretched canvas as my surface( I almost exclusively paint on panels), it's larger than most of my floral paintings and the positive shapes are much bigger/very little background or negative space. I try not to judge during the process- which only gets you upset and frustrated. But afterwards I can step back objectively for a self- critique to see what I learned. After the fact, I'm not as happy with the outcome as I have been with some of my other paintings, but the value has been in what I learned for myself about what feels right to me. Sometimes it takes what doesn't feel right to validate what does. I was doing this from a set up that someone else had arranged in a group class setting so didn't have an opportunity to change the set up, but if I were to do it again I'd change the 3 sets of sunflower pairs- maybe have 2 sunflowers and another group of 3. I could have spent more time on a compositional plan rather than just diving in and painting what was there ( okay students you caught me doing what I tell you not to do). I think I'd prefer to make the flowers smaller and have some more breathing room around them in the form of a background. What this format gains in terms of energy and abundance costs something in terms of elegance- at lest to my aesthetic preferences- and that's a personal call. The leaves on the table are darker in the actual painting than in the photo so probably just got washed out from glare off the wet oil, but if they were that light, they would need to be darkened. There are things I like like the free brushwork and the massed daises with some in light and others in shadow So those are some things to consider for next time. The good news is I have the photo's and can redesign a different composition from that, or even get similar flowers and rearrange a set up so there's always the opportunity to paint it again another day. class that I teach each week in Atlanta. Above is a demo painting that I did in class last week from the arrangement pictured below. 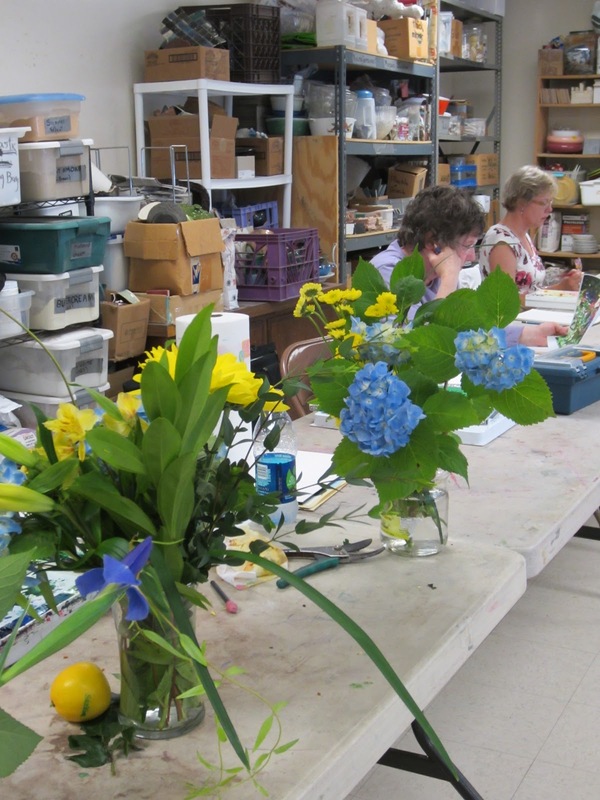 Also here are some photo's of students happily painting their bouquets. It's great to see the progress from week 1. Good work students! Your brush mileage is paying off! Here's a recent painting I did of a bunch of "knockout" roses in silver and copper containers. They have a little bit of a different structure than traditional roses but are equally as fun to paint. Below is the photo of the still life set up I painted from. 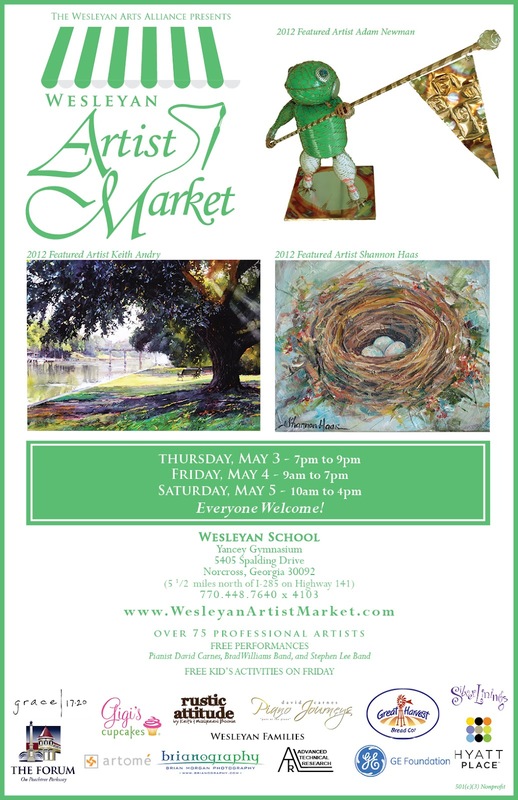 It's that time of year again for the Wesleyan Artist Market. It's a fun show that always has a great variety of quality art, jewelry, and other gift items from over 75 professional artists with proceeds benefiting the art program at Wesleyan School in Norcross. I've been participating in this show for about 5 years and will be back again this year with many brand new paintings. Hours are Thursday May 3, 7-9pm, Friday May 4, 9-7, and Saturday May 5, 10-4. It's free to attend and open to the public. The Wesleyan campus is located at 5405 Spalding Drive, Norcross, GA 30092, and the show is in the Yancey Gymnasium. See link below for directions.